Smoke and fire can do a great deal of damage to your property, plumbing and personal belongings. Once the firefighters leave your turf, make sure to call The Best Restoration immediately for fire damage restoration services. We offer specialized fire and smoke damage restoration services to clients in and across Gainesville, Florida and Alachua County. Certified and Trained Team for Fire Damage Restoration Professionals. At The Best Restoration, we have a certified, well-trained and highly-skilled team for fire damage restoration service. Our expertise and training enables us to professionally handle cleaning and restoration jobs after fire damage; and bring it back to its pre-fire state. Our team performs a thorough inspection of the damaged property and assesses the services that it will require to return your property back to the way it was before. Our services include restoration of the building, fire and smoke damage repair, cleanup, and water damage dry-out & repair. To make the process of fire damage restoration fast, smooth and stress-free, we are willing to work with your insurance company. Our team will meet with your insurance adjuster to cohesively create a restoration plan. At The Best Restoration, we provide smoke and fire damage restoration services round the clock. You can reach out to us for emergency fire and smoke damage restoration services anytime you you have a problem. Our technicians are available at your service 24 hours a day, 7 days a week and 365 days a year. Call us whenever you need us and we’ll respond immediately. It’s important to schedule for damage restoration services caused by fire and smoke right away for many reasons. Firstly, it’s important to understand that burned areas of the home or office are full of damages and hazards. Even if the fire has been controlled, the danger still remains due to smoke. This is because smoke can travel through your plumbing systems, and when synthetic materials are heated they become toxic. Besides this, the odor of smoke can make it difficult for you and your family members to breathe. Therefore, it’s extremely important to call us for smoke and fire damage restoration services to avoid such risks. We offer 24-hour emergency services. When you contact us, our representative will gather information about your fire or smoke damage emergency and dispatch a team with the appropriate resources and equipment to solve your problem. Our certified technicians will inspect your property carefully to identify the extent of damage caused by fire and smoke. This helps in determining our action plan. Before we start, we make sure to contain the areas that have not been affected by smoke or fire. This helps protect these areas from contamination and prevents further spreading. Most often the process begins with water removal because of the damage done to the piping and also the water used by firefighters to control the fire. We use dehumidifiers & air movers for water extraction and drying. 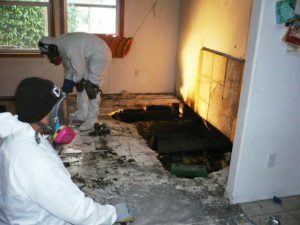 Specialized techniques and equipment are used to remove soot and smoke from all surfaces including but not limited to walls, ceilings, and furniture. 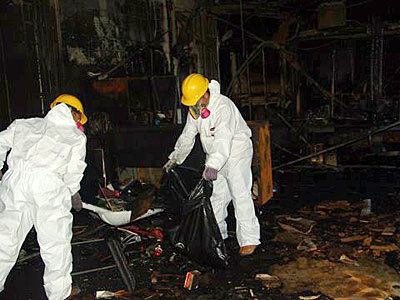 We cleanup the mess, structures, restorable items, and personal belongings alongwith the odor caused by soot and smoke. We use industrial-grade fogging equipment and air scrubbers to get the job done. At this stage we focus on replacements and repairs like replacing drywall, installing new carpets and reconstructing areas of the property that have been damaged completely to restore the structural integrity of your home or office. At The Best Restoration, we strive to deliver our clients a stress-free water damage restoration and cleanup process. Once you hire us for the job, our team will visit your property right away and begin the water removal process quickly. We use powerful pumps and industrial grade vacuums to efficiently remove water. This helps reduce the drying time and also, prevents mold & secondary water damage. Once the water is removed, our team then focuses on the drying process. Our team takes all your documents, photographs, furniture and other items offsite and to have them dried out. But before all this is carried out, we provide you with a recovery plan that is created with your assistance and which starts upon your approval. Call (352) 505-3321 to schedule for emergency fire damage restoration services. We are just a call away. Specialized Fire Damage Restoration Services in Gainesville, FL —We Strive to Restore Your Property Back to its Pre-Fire Condition.